Originally written by Lee Bryant on January 23, 2015. 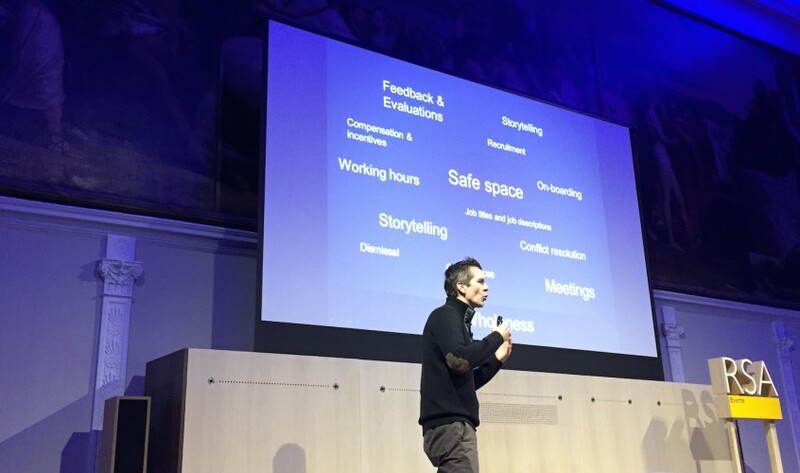 It was great to have the opportunity to watch Frederic Laloux talk about his book Reinventing Organisations at the RSA yesterday, although an hour was a frustratingly short amount of time to explore such as rich topic. Laloux believes there is ‘something in the air’ at the moment, which is leading various managers, management thinkers and organisations to the conclusion that we can no longer prop up the broken model of organisational management, but rather should take a leap into new methods and approaches. Self management : enabling decisions to be taken close to the ground, where they are needed, and by the people who are closest to the issues. Wholeness : focusing on the whole person, for example by encouraging softer, more intuitive behaviours as well as what Laloux labels classic corporate ‘male’ behaviours; but also focusing on the whole organisation, rather than seeing it as a series of separate functions. Evolutionary purpose : the idea that an organisation needs to find its purpose and gradually adapt towards it, rather than be driven like a machine. But one thing that stands out about the case studies is how each of them is so different, and none has attempted to adopt an elaborate pre-planned system for management. Instead, they have each evolved and adapted differently over time, so whilst the Dutch nursing organisation Buurtzorg is strong on all three of the above criteria, Morning Star focuses mostly on self-management, which it has demonstrated can be used effectively even in a relatively traditional industry. What they all have in common, and Laloux believes to be a necessary prerequisite, is that the CEO must drive the change and create the protected space for new methods to develop, and the Board must believe in the change and support the CEO in this process. The direct, peer-to-peer delivery model of Buurtzorg seems to be an obvious and logical way to run a social care organisation, but the fact that it seems so radical is testament to the damage that successive waves of management and organisational theory have done to the provision of healthcare in developed countries. Favi is a great example of a traditional artisanal engineering company that has made customer centricity a cornerstone of the way they work, so it is perhaps unsurprising that self-management and wholeness have worked for them. But how to scale this in large, complicated firms? But what of other more complicated organisations? How can we make this work in a complicated multinational corporation that bears the hallmarks of successive waves of ‘organisation as machine’ structures and processes? Laloux says that 50% of his answers to ‘how’ questions centre around the idea that an organisation needs the ability to ‘sense and respond’ as a way to accelerate the process of evolutionary change, rather than ‘predict and manage’ as managers are still taught today. But he also alluded to the need to reinvent or work around various standard management mechanisms in companies, such as planning and budget cycles, employee appraisals, procurement and other centralised services. These mechanisms, with their inbuilt assumptions about the way the organisation is managed, can present formidable barriers to progress unless they are reinvented in a way that can work in a self-management context. For some industries, external regulatory constraints can require the adoption of mechanistic processes, regardless of whether they are effective at solving the problem for which the regulatory framework was devised. The one process Laloux focused on during his talk was the decision making process, which tends to be run today in one of two modes, both of which are problematic: hierarchical or consensual. Each of the companies he has studied has had to find a better, simpler way that leaves as much decision-making power as possible in the hands of employees, and in most cases this has resulted in some variation of the ‘advice process’, whereby certain decisions require no sign-off, but other ones (perhaps bigger or riskier) require an individual – however senior – to have sought advice from relevant stakeholders or experts before they finalise their choice. This one technique – self-management bound by an advisory process – could do so much to improve the operation of most large companies today. My own experience in large companies suggests that the visionary CEO / board support prerequisite is necessary but not sufficient. Their structures are so byzantine and their numbers of employees, offices and departments so large that transformation needs to happen at several different levels at once. Empowering local leaders to transform their own area of operations is probably the most important place to start, but for them to sense and respond, they need a picture or a map of the wider organisation and how it all fits together. As part of our thinking about using the idea of a Quantified Organisation to guide transformation efforts, I suspect we will see the emergence of some new, simple tools to help local leaders sense and respond to problems or gaps in organisational design and practice. One question that Laloux’s work surfaces, and which is potentially controversial, is the question of whether an organisation can have an evolutionary purpose of its own, beyond the purpose and goals of the individuals that make it up, or its shareholders. I believe it can, and there are many great examples of organisations that seem to ‘want to be something’ analogous to Kevin Kelly’s ‘what technology wants’ thesis. This also raises questions of governance and ownership in long-lived organisations. The challenge of transforming complicated, large organisations is a tough one, but I think Laloux’s very simple conclusions from his research provide some useful pointers. If we can discover the evolutionary purpose of these organisations, and use this to create alignment around the medium-term mission, this can help us see beyond the complicated messy reality of short-term change efforts. By pursuing self-management and tackling the various barriers that stand in its way, perhaps by giving managers better tools to sense and respond to problems uncovered by employees, perhaps also by sharing the many small techniques developed by companies such as those Laloux studied, we can get further than we might imagine. Although the heart of this approach lies in humanising organisations, I think technology also has a key role to play especially in larger firms. Better tools are needed to help local leaders see the shape and capabilities of their organisation as it changes, and could also help scale the advice process, resulting in greater transparency of thinking and decisions as well, which can remove one of the basic arguments for management oversight and formal reporting lines because everything is visible. A good example of this is the way Automattic, the company behind the WordPress platform, operates as a virtual organisation. Enterprise social platforms today are a long way from providing this kind of utility, but the fast-developing world of enterprise apps will perhaps deliver these management tools in the not-too-distant-future.